Water: Over watering is the most common mistake with terrariums, however don't let them dry out either! Pour water directly into soil to make the soil moist once every 7-21 days. The best indicator is to lightly brush the moss and wood chips aside and feel the soil. Keep soil moist between watering but not soaking wet. Warm, sunny locations may require more watering compared to cold, dim locations. 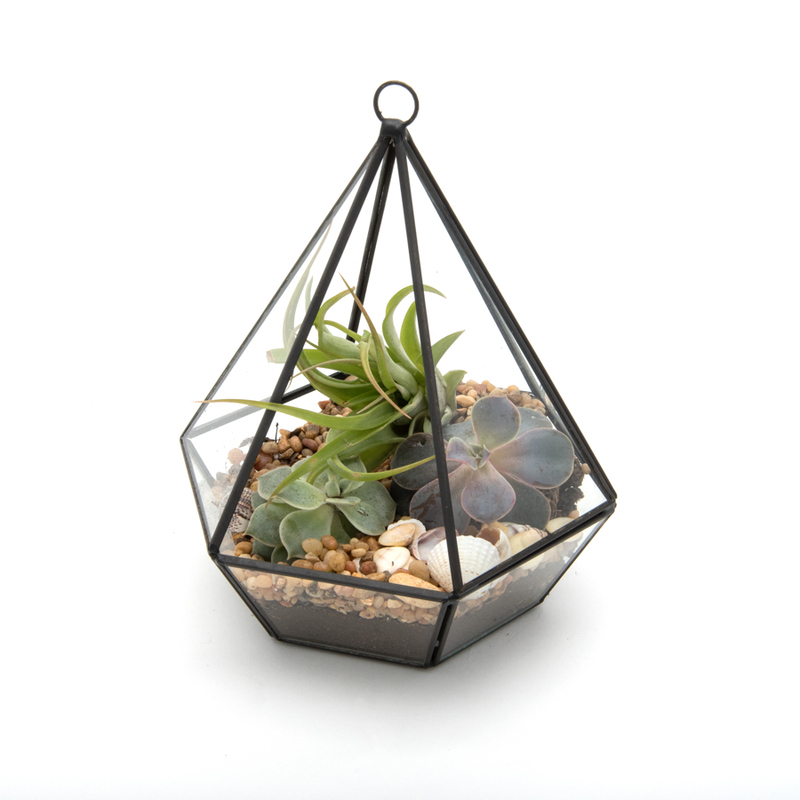 Light: Place Terrariums in bright indirect light to medium light. Avoid direct sunlight as the sun will burn and cook the plants! Pruning: Plants tend to grow slower in confined spaces however they will eventually outgrow there containers. To prolong terrarium plants, trim lightly (this will also promote side shoots that will fill out and make for more attractive plants). Remove all dead vegetation and any plants that start to rot (usually associated with too much moisture). Cleaning- When glass becomes cloudy, dirty, or spotty simply wipe with a damp cloth. Water: Desert terrariums still do require watering. Water and mist lightly every few weeks to several months depending on succulent or cactus varieties. Spiny plants need less water than succulents. Let the soil dry out completely in between waterings. If leaves start to shrivel more water may be required. Light: Desert terrariums prefer lots of bright indirect light. Never place in direct sunlight or outside! Plants will burn and cook in the terrariums. Pruning: Make sure to remove any dead or fallen leaves to prevent rot and contamination. Water: Air plants in glass terrariums should be watered every 2 to 3 weeks. Simply remove air plants and submerge for 1 hour in filtered or bottled water. Remove from water bath and shake off excess water or allow to dry overnight on paper towel. Place plants back in their glass homes. Brown tips may be from too much chlorine in the tap water. Mushy or blackened base is an indication of too much water and rot. 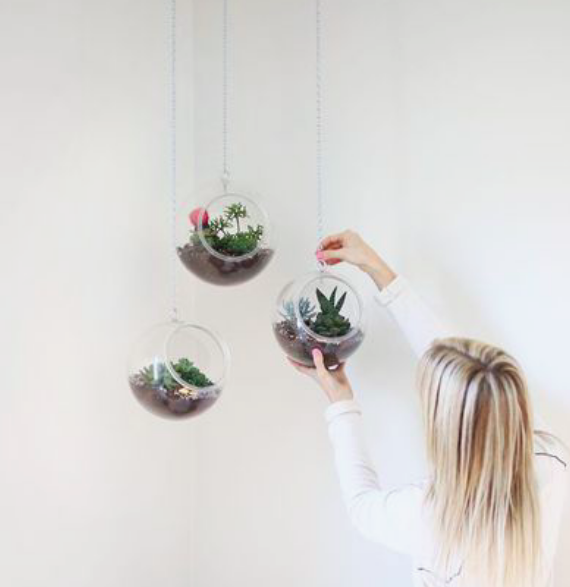 Air plants that are not in glass will require a light mist every few days. Try misting with Orchid Spray fertilizer to encourage blooms! Light: Keep Air plants in bright to low indirect light. Please contact us with any further questions!